I've begun to think now that I maybe just panicked this afternoon, and then over-reacted some. But I'm still not sure yet, I still don't know for sure. I am still shaking although, and what I'd really like to be able to do tonight is talk to Nalda. Even just for a little while. To see what kind of words she would have to say. When I was a boy, you see, I heard Nalda's words nearly all the time; while we sat out on the old sofa in the evenings, or while we swept up leaves in the winter lady's garden through the day And always she would tell me all about myself and how I'd come to be in her charge, and about the world too, and how things in it worked. And whenever I was confused by something I could go and ask her some questions, and listen to her talk, and slowly things would come back towards sense. But all of that was a long time ago now. All before the shouting, and all before the people came and Nalda went off And ever since then I've only been mostly afraid and confused, by the whole of the world and most things inside it. Almost all the time. And so... I still can't tell about this afternoon yet. I still don't know for sure. It's important, because of what lies within my charge, that I live always on my guard. And so lots of times I've misjudged things and over-reacted. But I'm not sure if that's how things were today, and I wonder if Nalda would talk until I could see some other sense in what happened, and it no longer scared me. Or if she would only look at her nail and say, "You did the right thing today You did the right thing, T.."
Ooops. But I almost told you my name there, and I don't mean to do that. Not just yet. Just in case. Just in case of things. So what I'll do instead, right now is I'll tell you all about what happened this afternoon, and about why I'm still shaking. The first thing you need to know I think, is that for quite a while now I've been working in the gardens of a city park. I suppose that's the first thing. I mostly always try to find work in places like that - first of all because gardening is just about the only thing I know anything about, the only thing that you can use for a job at least. And, secondly, because you never have to be around any other people too much of the time. In this place, because it was so big, I hardly ever had to talk to any of the other people who worked there at all. There were so many different things to be done most days that, between picking up my tools and getting my orders in the mornings and returning my things to the sheds again in the evenings, I might not see anyone else who worked there all day long. And that's the best way for me. I've never been around other people much, and because of that their ways mostly just get me confused, and then I get nervous. I spent most of it with the grass machine, cutting lawns at the very heart of the gardens. Then, towards finishing up time, I trundled it back to the sheds and got to work wiping the blades clean in there. I always liked it in the sheds at the end of the day, if there was no one else in there. Most times I tried to work on later than everyone else, sos as they would all be gone by the time I got back. And often, when I had cleaned up my tools and put everything away into its place, I liked to sit beside one of the windows and just be glad that I was finished with gardening for another whole night. And quietly make a wish that I would be freed before the next day from ever having to do it again. Today although, while I was still wiping the blades clean of grass, I heard the door opening behind me and I grew quite angry that someone had come in to spoil my peace. "Well, that's another one endured and conquered," the voice said, and I knew straight away who it was. I knew at once it was the boy with the pictures on his arms. "How was yours?" he asked me while he clattered his tools down onto the floor, and I felt myself grow tight and shy And I fixed my eyes very hard on the blades of the grass cutting machine as I wiped them, even although all of the grass was gone by then. No one else who worked at those gardens even tried to talk to me after the first one time or two times. I think some of them worked out that it wasn't one of the things I was good at, and that I just didn't know how to do it properly. And some of the others, they became a bit offended by me not ever answering them properly I think. Either way they all soon came around to leaving me alone, which was good because it meant I couldn't let any information slip which might put me in danger from them. But the boy with the pictures on his arms, he was different. He just kept on by talking to me whether I gave him any proper answers or not. It didn't even seem to matter to him very much if I answered at all. And when he had hung up all his spades and things, he dragged the chair from the window across to where I was wiping the blades, and he sat down on it there. Kind of backwards. "That looks as if you've got them cleaned now," he said to me, while he shifted around on his seat some. But I continued to wipe for a bit more anyway Then, when I felt like it was getting to be stupid, I got up, all unsure of my movements because I felt like he was spying on me some, and I put the cloth away in a drawer. I even pretended to look for something else in there too, in the hope that he would just go away before I was finished. But he didn't go. He just kept on by sitting there. When I turned around, although, I noticed he wasn't spying at me at all. He was just touching the pictures on his arms instead, with his fingers, and looking at them all carefully So seeing my chance I said "Good night," in a voice that came out all cracked and quiet, and then I hurried out of the shed and closed the door behind me. I even thought I was going to get away with it too, because the door stayed shut until I was quite some steps away But it was never so easy to escape from the boy with the pictures on his arms, and soon I heard the door opening again and him shouting out to me, while he snapped the padlock of the shed onto the door to lock it up. "Hang on there," he said as he ran after me. And without even making my eyes look at him I watched him tying a scarf around his head, just from my corners. "Are you busy right now?" he asked me, while he tightened the knot at the back of his head. "I know you don't speak much, but there's something I want to show you. Something I found today Are you doing anything else just now?" I was still thinking of a way to run off from him at that time, and when we reached the end of the track which leads from the sheds to the main path I just turned my back on him quickly, and started walking off. But he ran after me again. "It's this way," he said, catching me lightly by the arm. "It's not that way, it's this way" And as we stood looking at each other, and I watched him tugging on the knot behind his head, I suddenly had the idea that maybe he was just lonely for some company, and that was something I knew a bit about. "It's just something I thought you might like to see," he said. "Something I found in a flower-bed this morning. I'm not quite sure what I'm going to do with it yet, but I know I can trust you not to tell anyone else here anything about it, so you can see it if you want." He tipped his head to the side then and I was still anxious not to be there, but slowly I turned to face the other way and he nodded at me. "You're quite a strange guy," he said. "I hope you don't mind me saying that. But Christ... I mean, I'll bet you don't make many friends acting like you act." Then he laughed and I tried to do a smile to him, but I'm not good at smiling to people. In front of a mirror I can do one alright. When I can watch my own face. 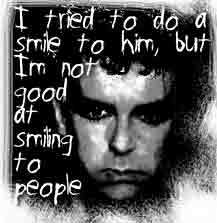 But whenever I try to do a smile to someone else I always think it isn't going to work, and then it doesn't work. I kind of make it not, I think, by thinking that. So I looked away towards the flower-beds as soon as I felt it failing, and then I covered my mouth with my hand. We walked quite a way back through the gardens, the boy with the pictures on his arms and me. And then we walked beyond the gardens and on into the rest of the park. All the way he kept on by talking, the boy, and mostly I didn't even know what he was saying about, like I never do. But he did say a few things about how he wished he didn't have to work in the gardens, and how much he didn't like it, and that surprised me some. It surprised me because I'd always thought it must only be me who didn't like it, and it was a secret I was scared about in case anyone found out and then told me I couldn't work there anymore. And I would be left without my money. So it made me feel good, just that. And I wanted to say something to him about it and agree some. But just when I was getting ready to, he stopped walking, at last, and he pointed over towards a tree near the fence. "I've hidden it there," he said. "In a hole in the trunk." And he hurried off across the grass and had me follow him. It was a very broad and old tree which he brought us to, with gnarled and old branches, and a hole at the bottom of the trunk just like he'd said. And while he knelt down in the grass, I leaned against the trunk, and watched him feeling with his hand inside. "I think you're going to like this," he said to me. "I really do." And it was just then, as he drew his hand out from in the hole, that all of everything started happening at once. The thing was, you see, it was a knife he pulled out from in there. A knife with a black, black handle and a long curved blade. And while he stood up again he did the strangest grin to me, and the time started to move very strangely It went all slow to begin with, and in just a single second I studied the boy's mad grin and some of the pictures on his arms, as well as thinking that what I'd been terrified of for years was very probably just about to happen. Then, as the boy took another step towards me, I watched the sunlight glinting upon his blade. And when he turned it, and the light flashed directly into my eyes, suddenly time was racing instead, moving at twice its normal speed. And then so was I. Running off towards the fence with my coat flapping on my knees, and my heart thumping terribly. I heard the boy shouting something behind me, but I didn't hear about what it was, and I didn't turn around any too. I just climbed over the fence as soon as I came to it, ripping my trousers and cutting my leg. And on the other side I tripped on something and fell out full. But I didn't even lie for a minute. I was back up again and running as quickly as I could be. Running and running. To begin with, I ran back to the room where I'd been staying all the time I was in that city But as soon as I arrived there I realised about how stupid a thing that was to do. And so as quickly as I could, I put a few important things into a bag and I ran out again. And all I did do was keep on running then. Running and running. On and again. For a very long time. Nalda said I first came to her in a complicated array of rags, silent and afraid, when I was just newly two years old. I was wearing a shirt and trousers which had been all tacked up the back with pins, she said, to pull them in tight against my body And, also, they were all rolled and folded at their tops and bottoms, so that the bits of me which were supposed to stick out still stuck out. And she always laughed then too, and pulled me in towards her - in towards all of her dark scarves and skirts, and her warm hair and her chains. And she would rattle me about like that to keep me laughing, until I asked her to tell me about myself more again. There were so many stories Nalda knew. And I would ask her for the same ones about myself and about things in the world over and again. And whenever I asked her for a new one she would always have a new one too, and after hearing it two times, about, I would have a name for that one also, and I would begin to ask for it over and again too. But my favourite story was always the one about how I first came to Nalda in a complicated array of rags, silent and afraid, when I was just newly two years old. That was the one I asked for the most often of all. And after Nalda had rattled me, and I had laughed until I was tired, sometimes she would open the tin she kept in the drawer - if she was in a very special mood. And she would take out what she said were the pins that had been used to tack up my trousers and my shirt that time. And she would let me look at them some. Even now I still have those pins with me. I keep them in a tin of my own now. And when I grabbed a few things to take away with me this evening the tin was amongst them. It was one of the first things I threw down into my bag. I wouldn't have left that behind. I realised, when I had no more breath left for running this evening, that I didn't even have any idea about where I was running to. And so that was why I stopped. What I saw when I did stop, although, was that I was just close by to the bus station. So that was where I went to then. At first I was going to look at the map outside of the ticket office, to choose a place from there which wasn't too near and wasn't too far away. Somewhere that wouldn't be too easy a place to guess about, or that wouldn't be an obvious place for me to be heading to, just in case the boy would still try to follow me. But then I had a better idea that I would just go and look at which coaches had the least people inside, and which ones didn't have anyone on who could possibly be the boy with the pictures on his arms, in disguise. And that way, too, it meant that if he should catch up to me soon he couldn't ask at the ticket office about where I had bought my ticket for, and then he would be stuck. If I had just bought my ticket on board. So I found a coach with hardly any people inside of it at all, which was also going quite a distance away And I got up on board and settled down towards the back, close by to the door made for emergencies. It was only a few minutes till the bus left, after I'd got on. But all the time I lay away down low on my seat anyway, hiding where I couldn't be seen from the outside. And all the way out through the city I did the same, just peeking up over the bottom of the window's edge every now and again, to see what I could see. I stayed like that, too, while all of the buildings were getting less, all the way out until it was only fields that were lefi on both sides of the road, and the city was far away and behind us. And only then, very slowly, did I begin to raise myself up in the seat at last, feeling a little bit safer. And feeling gratetul, too, through my shaking, that I had gained some more time to await the thing which I await. It wasn't until the bus had been going on for over an hour, although, that I first began to wonder if I hadn't maybe just panicked some back in the park before. And then over-reacted. Before that there hadn't been any doubts in my thoughts at all. I was absolutely sure about what I thought had almost happened. But while I'd been sitting watching the sky getting darker above the fields, with my cloth bag pressed away in tight against my chest, I'd slowly began to wonder just how the boy with the pictures on his arms could possibly have known about me. I hadn't never hardly even spoken to him during all the times he'd tried to speak to me, so I was certain that I'd never let anything slip to him that I shouldn't have. And then, too, as the bus kept moving, I also began to remember about a few kindnesses he had shown to me in the past, and there was one in particular which I kept on by thinking of which really made me think he wasn't that kind of a one at all, and which made me think that maybe the knife really had been something he'd just found and wanted to show me. To try and even make a friend of me. And so that was when I first began to think that perhaps I had just panicked. It wasn't long after I'd first arrived in that city, and before I'd been working in those gardens for very long at all, that the boy with the pictures on his arms did the kindness for me that I kept thinking of while the bus rolled. To begin with, I'd worked mostly in the rose gardens there, over where the gardens joined onto the main part of the park, where lots of young people always came to kick footballs around, or to throw those things like disks to each other. So the thing that happened was, there was one group of older children who never did used to kick any football around, or throw any disk or anything much at all. Always they just used to drift about mostly and maybe smoke some cigarettes, and maybe push each other around sometimes. And spit and stuff. So, one day they were all quite close to where I was working, and a few were looking at me, and then one of them shouted out a name at me. I don't remember what name now but I became quite tight and quite shy And I got quite awkward about what I was doing and I even blushed some, though I don't know if they could see that. But I didn't shout anything back to them although. And I think that was what turned out to be the wrong thing. They all came kind of closer then, and they started to all shout the name at me, and then all different things. And I just concentrated hard upon a rose, and pretended to work very absorbed until they went away. But after that, they kept on by coming back a few days more, and I would get nervous and things as soon as I saw them. And they always stopped to shout for a while. Sometimes they even came closer, and maybe flicked my sleeve or something, or flicked my hair. But always I pretended just to be absorbed by my work, while all of them giggled and shouted, or just made a strange noise. And then one of them curled a fist around the head of a rose once, and said, "What would happen if I pulled this, mister? What would? Would it bleed?" But still I kept on by staring at what I was doing, and then another one tugged at my sleeve and said, "What would happen if he did that, mister? Would it bleed?" Then another one, a girl, she said, "Don't you think I look like a rose, mister?" to a lot of shouting and laughing. "I do though," she insisted. "Don't I, mister?" And she touched my cheek with her fingers, and all of them laughed. "Would you flick her, mister?" a boy asked then. "Would you want to?" "He would too! Look at him blush..."
I still kept on just by seeming like I was absorbed in my work although. Not looking. Mostly I didn't even know what they were saying about, and younger people always make me even more confused than older ones, some of them. So I had no idea at all about what to do. But that was when the boy with the pictures on his arms came along. Just then. And he grabbed one of them by the arm and he shouted some. And I looked up just quickly and I saw that they all looked pretty scared. Very scared really And the boy said about what he would do to them if they came around that part again, and he said to them about how I would let him know if they worried me ever any time again, and about how he would get them all one by one if I said that. I tried to do him a smile just then, but I think it failed quite a lot, and I heard one of the children start to laugh. But the boy with the pictures shouted pretty loudly at him, and he stopped right then, and no one else laughed. Then, in time, he let go of the one he had grabbed, and they all ran away together then. And I never did see them again. So it was thinking all over that, which really got me to thinking that I'd maybe just panicked today, along with, of course, wondering about how he could possibly have known about me, in the first place. What Nalda used to say you see - about people, I mean - was that all but the very few would rip and tear at even the most precious of things to get to that part which would bring them profit and gain. And not just nasty people, she said. But just about all of everyone, almost every person you could ever meet, all except for the very most gentle and kind, and also the most very pure. It wasn't really that they were bad, she said most times, but only really that they were lazy and tired. Or else ignorant of any other way. But whichever, that's what makes up the main reason of why I must keep a distance really, and be careful never to get so close as to let anything slip which could put me into danger from their ways. And that made me wish a bit that I could go back, even although I couldn't. When the bus finally got to where it was going tonight, I waited until all the other people inside had got off and wandered away, before I got down too. Then, with my bag still pressed in tight against my chest, I looked around at where I had got to, and then I looked around for a place to stay for tonight. I continued being a bit cautious outside to begin with, looking a few times behind me while I walked, despite all of what I'd thought on the bus. Just to make sure that the boy hadn't followed me there. But I soon got to be convinced it was alright, and I soon found a hotel place that looked okay, so I came inside. Always, in the pocket of whatever shirt I'm wearing, I keep a supply of emergency money ready. Just enough to take me away from wherever I am, on a bus or a train, and to pay for a room for the night wherever I end up, in case something should happen which makes me have to leave. Like it always does. The room I'm in now looks almost exactly like all the other rooms I've stayed in at times like this. And once I'd been shown in, and I'd locked the door up behind me, I did what I always do first, after up and running. I unfastened my cloth bag and sat down on the bed with it, to see what things I'd brought with me, and what things I'd left behind. I had the tin with my pins inside, of course. And most of my clothes too, which aren't really many anyway Then, besides that, I had my can and my utensils, the book with some pages pasted inside that I've saved from newspapers, a couple of special things to eat, and that was all. I'd left a lot behind again, like I always do. I'd left a lot of trinklets and ornaments I'd collected, and some photograph pictures I liked to have on my wall. But what was most important of all was I'd left my jeweller's eyeglass behind, and that will make things a lot more difficult for me. I found that, one day just when I was digging up a flower-bed in a park, and I didn't even know what it was at first. But once I'd worked it out, and cleaned it up, I was very pleased at my find. And I started using it the very next morning. I've been using it every day too, from then. And I even know exactly where I've left it. I can picture it sitting exactly on my bed, back in my last room. And I could even kick myself. Usually I always left that lying with my utensils together, but this morning I just brought that through by accident, and laid it down there. I'll have to buy an old kind of stupid magnifying glass tomorrow again now. Anyway although. It feels like as if it's been a long day today. My terror in the park even seems like it could have been a week. And leaving my other room this morning, to walk through the people to the gardens, that seems like it could have been a year. So what I'm going to do now I'm going to wash. And then I'll get my can set up, just sos as it's ready. And after I eat some stuff, I'm going to lie down in my bed. And hopefully I'm going to go to sleep. Stuart David wrote Nalda Said before embarking on a musical career, co-founding Belle & Sebastian and later the multimedia act Looper. He has recently signed a film deal for his second novel, The Peacock Manifesto. Nalda Said has been translated into seven languages including Japanese, Norwegian and German. David lives in Glasgow with his wife, Karn.